ISLAMABAD: Encouraged by the recent results of by-elections in Punjab, the Tehreek-i-Labbaik Pakistan (TLP) has fielded more candidates than the Pakistan Peoples Party (PPP) for general seats of the Punjab Assembly. A careful analysis of the “final list” of candidates issued by the Election Commission of Pakistan (ECP) for the July 25 general elections shows that the candidates belonging to religious parties and groups, perhaps for the first time, have outnumbered the total number of provincial assembly constituencies in the country’s largest province, with the number more than double the allocated general seats. The ECP has put on display the list of the candidates contesting for 290 general seats of the Punjab Assembly, out of the total 297 seats. The data reveals that 585 candidates are using the platform of four religious parties and groups. Besides them, a few other smaller religious parties like the Pakistan Sunni Tehreek and Muttahida Ulema-i-Mashaikh Council of Pakistan are also in the electoral field in Punjab. It may be recalled that due to failure of the PPP leadership to re-organise the party in the province after its disastrous performance in the 2013 elections, the Pakistan Tehreek-i-Insaf (PTI) and religious parties gained strength and in some of the recent by-polls, the PPP candidates remained far behind the candidates of religious parties. Details of the candidates from 290 constituencies show that the TLP — the party that gained prominence after it staged a prolonged sit-in at an intersection between Rawalpindi and Islamabad crippling the life of the residents of the twin cities last year on the issue of Khatm-i-Nubuwat declaration — has put up 259 candidates, whereas the PPP has fielded 234 candidates. The TLP that is contesting the election on the symbol of “crane” is at number three in terms of the number of candidates in Punjab, after the PTI which has fielded 279 candidates and the Pakistan Muslim League (PML-N) with 266 candidates. The TLP headed by Maulana Khadim Hussain Rizvi has also fielded over 100 candidates for the National Assembly seats from Punjab. The number of its NA candidates is even more than those fielded by a bigger religio-political parties’ amalgam — Muttahida Majlis-i-Amal (MMA). The recently revived MMA — an alliance of five religious parties, including Jamiat Ulema-i-Islam-Fazl and Jamaat-i-Islami — is contesting the elections from 161 constituencies of the Punjab Assembly. Besides these groups, there are 121 candidates in the field from the platform of Allah-o-Akbar Tehreek (AAT) which is contesting the election with the symbol of “chair”. The AAT came into existence after the ECP denied enlisting the Milli Muslim League due to its alleged links with banned outfit Jamaatud Dawa led by Hafiz Saeed. The AAT has also fielded 50 candidates for the NA seats — 43 in Punjab and seven in Khyber Pakhtunkhwa. 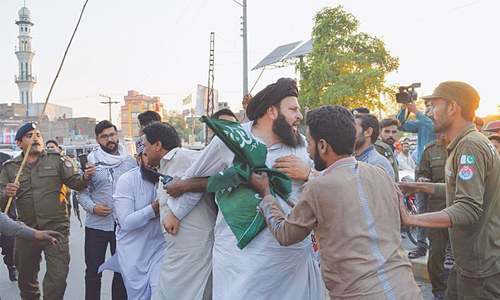 There is another religious group with the name of Tehreek-i-Labbaik Islami (TLI) headed by Dr Muhammad Ashraf Asif Jalali, a former associate of TLP chief Khadim Rizvi, in the electoral field and the party has fielded 44 candidates for various constituencies of the Punjab Assembly. Its election symbol is “cannon”. Like in the case of National Assembly, “jeep” — which was allotted to disgruntled PML-N leader Chaudhry Nisar Ali Khan who is now contesting for two NA and two provincial assembly seats independently — is the most sought-after election symbol of the independents contesting for the Punjab Assembly seats. In 290 constituencies, there are 191 independent candidates in the field with “jeep” symbol. It may be recalled that as many as 66 independent candidates are contesting the polls on the symbol of ‘jeep’ from 117 NA constituencies in Punjab. The allotment of “jeep” symbol in such a large number and to most of the PML-N dissidents has triggered a debate, particularly on social media, suggesting that those contesting on “jeep” symbol are backed by the establishment. The PTI has put up its candidates on 96 per cent of the total constituencies, whereas the PML-N candidates are vying for the PA seats in 92pc of the total constituencies. The PPP, which is facing a tough time in the province after joining of the PTI by a large number of its senior members, has placed candidates in 81pc of the PA constituencies. This time the party has given tickets to a good number of its activists due to the absence of “electables” in the party fold. Without BB the Pakistan People's Party has aged out. Secular PMs, secular generals and family-owned parties have nor delivered. I will support the religious for a change. At least they don’t have billions in foreign properties and bank accounts.